Since 2006, Shepherd Song Farm owners Judy and Larry have volunteered with Farmer-to-Farmer programs in Ethiopia, Egypt, Guinea, and Mali. Through this program, they have partnered with small farmers to improve livestock husbandry practices and currently direct a USAID funded project Common Pastures. Encouraging families to prepare nutritious, local foods combined with a small amount of protein is critical for the health of all and especially children. 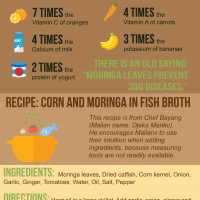 Moringa, known as the tree of life, is found in subtropical climates and is chock full of important vitamins and nutrients that are difficult to source in rural, semi-desert areas. 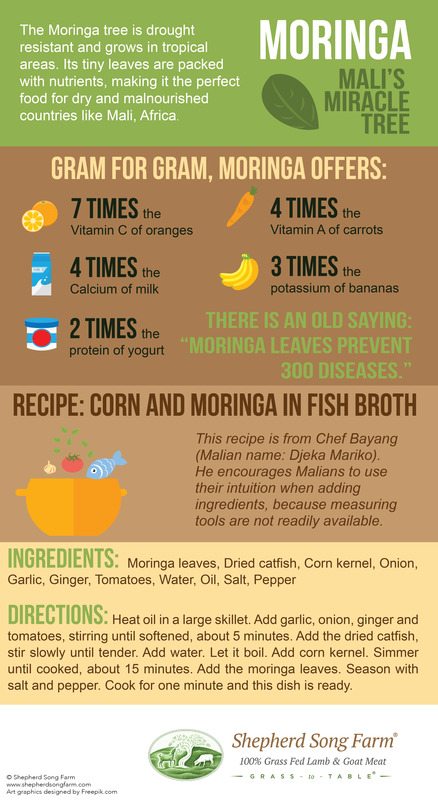 The following recipe contains Moringa leaves (frequently available in U.S. markets) and other local ingredients. By sharing recipes like this, it is our hope we all can share healthy eating ideas using foods that are nutritious, locally and seasonally available.